Our assisted living communities are dedicated to the mission that every resident, and every staff member, is a vital part of our extended family. In keeping with that commitment, our ‘family values’ are the guiding force behind everyone, everything and every day at Kaplan assisted living communities. Our staff of professionals are highly experienced, knowledgeable and caring, devoted to making certain that our residents are always treated with respect and dignity and that they receive the personal attention they deserve – whether it's help with the challenges of daily living as they grow older, determining which recreational programs to sign up for today, or simply lending a listening ear as a resident recounts a beloved story. At Kaplan Development Group, we are defining excellence in assisted living by ensuring that each one of our residents enjoys an independent lifestyle, and yet, they and their loved ones will know that the finest assisted living services and health care are here. Just look around and it’s easy to see why our communities are someplace special. 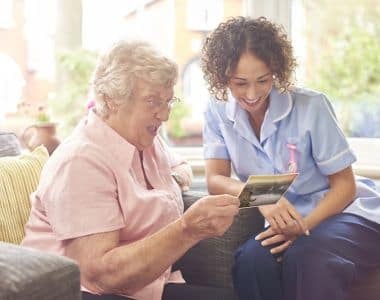 Our residents partake in all the pleasures that life has to offer, and at the same time, they and their families have the comfort of realizing that virtually any need will be taken care of through our customized care programs. Our apartments are exquisitely designed to be comfortable rather than palatial, homey rather than institutional. All amenities are easily accessible, and our staff is available to exceed your needs and expectations to ensure your comfort at all times. A variety of floorplans are available at each community. Dining is an essential part of life and health. At Kaplan Development Group, we understand that food is not only necessary for nutrition, it is also an important opportunity for regular and ongoing social engagement. Our dining program offers meals that are home-cooked for flavor and served restaurant-style for comfort and convenience. Our professional wait staff takes care of everything, enabling our residents to enjoy healthy, delicious, and relaxing meals with their neighbors. Lecture series and workshops through our lifelong learning program, book clubs, and discussions around current events. Walking groups, tai chi, chair yoga, low impact aerobics, strength training, and gardening. Religious services, bible study, discussion groups, and meditation. Computer instruction and assistance with email, Facebook, Internet use, and Skype Recreation Parties, seasonal events, movies, bridge, bingo, group word games, and trivia nights. As part of our commitment to offering innovative, fun and educational programs the Frequent Flyer Loyalty Program was created. With loyalty cards for each resident and awards at the end of each month for those with the most participation, our program encourages engagement and rewards participation. Programs ranging from guest lecture series, drama instruction, book clubs, and more are part of the monthly offerings. Living at a Kaplan community means our residents are engaged in a wide range of fun activities, from entertainment to enrichment. Whether it’s a lifelong passion or a new skill, our residents will have diverse and constant opportunities to engage with others, enjoy themselves, and continue to grow as a person. With 24-hour on-site personal care staff and licensed nurses providing personal care services, individualized wellness plans, to on-site medical services, residents get the care and support they need. Each community has been designed with plenty of options for fun things to do and comfortable places to do them in. Our communities all feature state of the art 24-hour emergency response systems, individual heating and air conditioning in each apartment, a concierge desk, and other welcome features and amenities. Our communities are designed to offer spaces and amenities to encourage your friends, children, and grandchildren to visit and enjoy your new home.